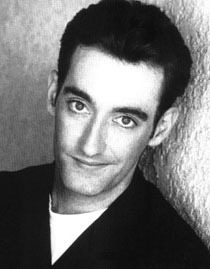 Tom Kenny does voice work for cartoons, video games, and commercials. He has described himself as "a man of a thousand voices, many of them gay." His most famous vocal creation is SpongeBob Squarepants, the titular kitchen sponge on Nickelodeon. Kenny's Spongebob squeaks and giggles have been described as "a potent combination of Jerry Lewis's geekmania and Pee Wee Herman's pathological optimism". Kenny and Bobcat Goldthwait were best friends from their childhood, attending the same parochial elementary school. They first worked together when they were hired as a team by Barry Crimmins (now a succesful comic and political commentator himself). Kenny and Goldthwait performed stand-up together at local clubs as Tomcat & Bobcat, and co-founded a local comedy troupe called Generic Comics. Kenny remembers a conversation with Goldthwait from mid-'70s high school days, when they asked each other whose show-biz careers they wanted to emulate. Goldthwait said he wanted to be John Belushi. Kenny said he wanted to be Mel Blanc. Of course, there was little career to be had if Kenny stayed in Syracuse. He bagged groceries at Price Chopper for six years, before leaving for Boston and eventually San Francisco. His comedy evolved into impressions and sketch work, and he auditioned for Saturday Night Live, where was a finalist when the show had two openings, which were filled by David Spade and Rob Schneider. Kenny's first steady paycheck as a performer was Fox's sketch comedy The Edge, where he worked with Jennifer Aniston, Julie Brown, Wayne Knight, and Alan Ruck, among others. He later found success on the HBO sketch show Mr. Show with Bob and David, eventually marrying fellow ensemble comic Jill Talley. Kenny's hyperkinetic vocal abilities have made him so omnipresent, almost any American with a TV is probably familiar with his work. Various permutations of Kenny's cartoon voices can be heard on Batman (as The Penguin), CatDog, Cow & Chicken (as Duck Duck Chicken), Dave the Barbarian, Dexter's Laboratory, Dilbert (as Ratbert), Adam Sandler's Eight Crazy Nights, The Fairly OddParents, Futurama, Mission Hill, The Mummy, Peter Cottontail, The Powerpuff Girls (as the Mayor and narrator), Rocko's Modern Life, and Stripperella. He voiced "Tweety Bird" for Looney Tunes video games, and did further voice work for the "Spyro" video games. He has also done voiceovers in myriad commercials, hawking everything from Home Depot to Kraft Macaroni and Cheese. In Goldthwait's masterpiece Shakes the Clown, Kenny played another clown, Binky. Goldthwait and Kenny also worked together on the Showtime sit-com Out There.